This cooperative printable game with fractions can be used as review prior to an assessment or as a pre-unit prior knowledge assessment. Students answer questions on each other’s boards, and record their name on the squares they answer. When bingo is played, the students whose names are on the squares must give the correct answers for bingo to be awarded. The review is twofold: when they answer each others’ boards and when answers are reviewed during the bingo game. I hope this helps to make reviewing fractions enjoyable for you in your classroom! Check out Find Someone Who… Knows Expressions Game! and Find Someone Who…Knows Equations Game! for the same math game but with different concepts! 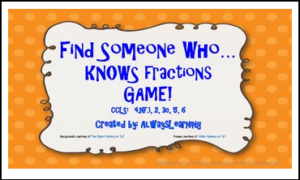 Also, for students in 6th-7th grades, Find Someone Who…Knows Fractions, Decimals, and Percents Game! is effective as a prior knowledge assessment or review! • Look for the green star near the top of any page within my store and click it to become a follower. You will now receive email updates about this store!